B. We need to take photos of our homes for January posts and we can’t have Christmas decorations in those posts. Now option 1 is to leave everything in place, and that is totally acceptable and really I think most people do this. Option 2 is to take everything down. Oops that’s an old photo of my fireplace before I did the last finish on it. Still, you get the idea. Option 3 is to transition your home from Christmas to New Years, by taking down some of the red and leaving mainly greenery and gold and silver. What do I mean? I mean, keep your silver out, and your greenery. Below I added boxwood balls and other preserved greenery to trophies and champagne buckets. The look says it is winter, but still feels festive and the shiny surfaces feel like you are still celebrating. Below I have a new (to me) chalk-ware bust of a girl. The silver candlesticks also feel like it’s a special occasion. Oh and did you see those antique books? They were published almost exactly a hundred years ago! 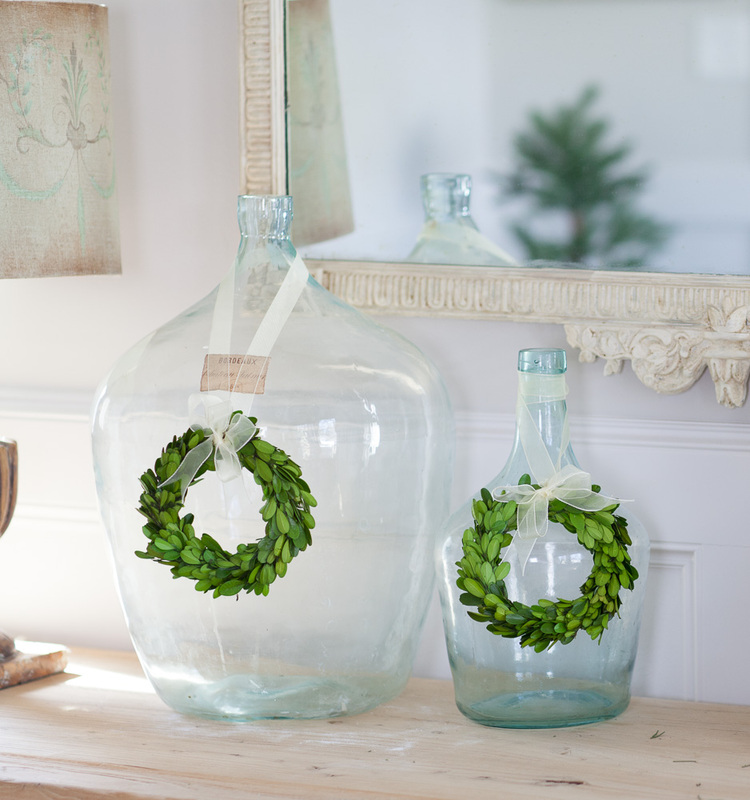 I kept the boxwood wreaths on my vintage bottles. 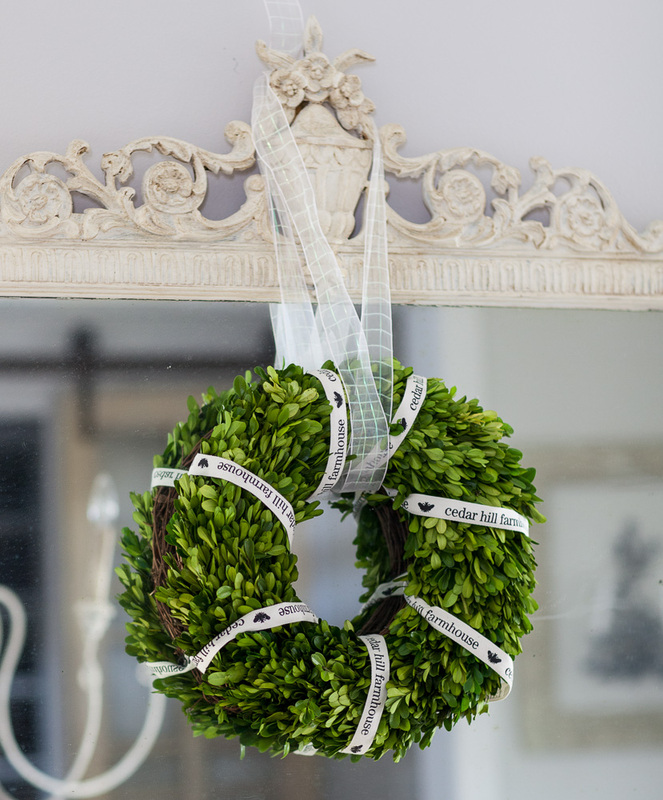 I love boxwood wreaths no matter what month it is. I’ve got a large boxwood wreath hanging on my mirror. 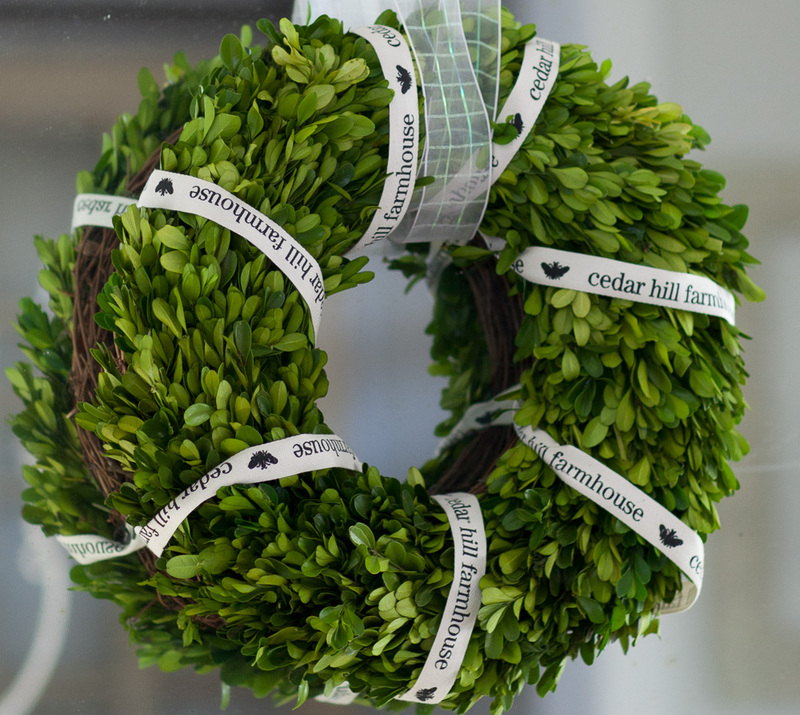 Yes that’s Cedar Hill Farmhouse ribbon. I use that ribbon when I wrap packages purchased in my online shop. I loved it so much, I wrapped it around the wreath. 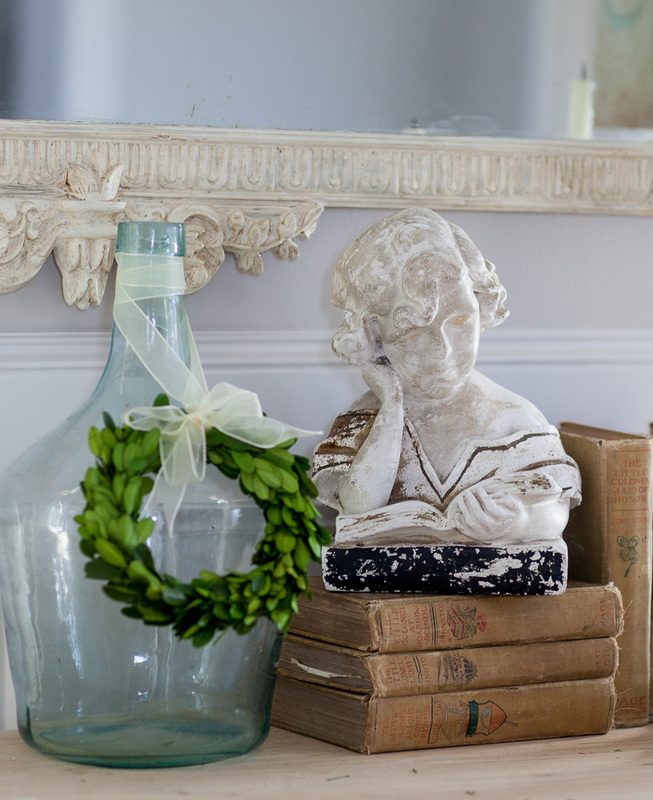 The wreath looks so elegant against the fancy hand-carved mirror. Here’s a close up of that chalk ware girl. I think she’s adorable!! I love using champagne buckets! If you are taking the ‘transition’ approach, I think all of the blingy decor works beautifully, like this reindeer. I would love to hear how you handle this time between Christmas and New Years Day. Although I usually take down my tree before New Year’s Day, this year I’m actually leaving my tree up and taking it easy. I’m not in a hurry to take it down. Happy New Year! I pray that you have many blessings in this year to come. Love the idea of removing the reds yet keeping some of the gold and silver. Just seems to transition to the New Year nicely. Thanks for the ideas. . . I took down my tree today but I will leave out my greenery and add some silver candle stick holders for bling. Happy New Year and looking forward to more blog posts in 2017. I have followed you and so enjoy having you in my inbox. Thank you for all the ideas. Happy New Year. Great idea to remove red decor,Santas will go and since I mostly have white pieces I’ll work on the red pieces first…I usually wait til January 6 to take down my trees. It’s Little Christmas and a family tradition. Always great, inspiring ideas!!! Love keeping the greenery out and adding some bling. I never look forward to taking everything down after Christmas however, after reading your blog, perhaps I can leave the greenery and shiny objects out a bit longer. That won’t make the task seem so daunting. Thank you for the inspiration! Christmas is such a magical time of the year whether you are a person of faith or not. The whole idea of bringing light and all things shiny into your home is wonderful. Although I am reluctant to take down my Christmas decorations, you have inspired me to decorate for the new year; and I plan to use some of the beautiful antique silver vessels my mother gave me and fill them with a few green sprigs and snowy pine cones! Thank you for always showing us something inspiring. I love all my lights and turning them on in the morning and evening, but the angels on the mantel, though lovely start to bother me, so I will start tomorrow and leave the lights for a bit! Thanks for sharing the after Christmas options! I love the idea of leaving up the “bling and green”. Still have some special decor for the new year, but feels like I made an effort to put away some of the Christmas decor. Great transition idea! I love your little chalkware girl also. She would definitely stay at home if she were mine. The greenery and silver is so lovely, cheerful and even peaceful to me. Thanks so much for your blog. Great ideas. I typically don’t take down anything until January 6th but my live tree is terribly dry this year. It may come down today. I have done the same thing…taken down my Santa’s & the red accents. Not quite ready to put my tree away just yet. I LOVE this idea! When my kids were small I would pull out all my silver on December 30th and place it all around the house! All of my silver tea service, platters and bowls. I would put the silver platters on plate display stands so they would catch the light. I continue to search high and low for silver trophies. They look beautiful with Christmas greens. Love the idea of transitioning rather than removing everything at once. Makes the season last longer. Thanks f or your ideas. Ginger, you beat me to the little girl! I did think the exact same thing! I usually take Christmas decorations down around New Year’s but I leave my snowman collection up until the end of January – even though we are having 75 degree temperatures here in Fort Worth! Hoping for some cooler temps! I also like to use a lot of white candles for a wintry glow. I switch from Christmas over to a winter theme as well. You’ve given me some great ideas on how to make the transition. Happy New Year! Love the leave the greenery and ditch the red; so simple! Thanks! I too leave my greenery out along with silver and white decor through January. So simple… leave the greenery and ditch the red! What a great tip! Thanks! Thanks for the ideas, I like the transition of things. I usually take most down on Jan 6. The little girl is adorable! I love your style. I’m looking for settee with the stripe in the center. Any ideas? I never see them that way. You will probably need to buy one and have it redone. I had mine reupholstered. You’re right. I started with velvet pumpkins in September. I was so ready to take things down and have a simple, clean home again. I love my Christmas tree and the lights, but for me, it was time. Everything in my shop was packed up on Monday. Time to think spring. I try to transition by removing any vestiges of Santa and/or red, but I leave out all my mercury glass and bring new greenery in to observe the new year. I also put out new white only candles. More like winter solstice style. It helps me feel better after all the Christmas decor comes down. Plus it’s pretty bleak around here during the winter!!! Happy New year….. I appreciate the options.. I do what you describe as a option 3. I take down all “Santa” and “modern Christmas” with exception to the actual decorated Christmas tree. ( It would come down too except my sweet husband objects) I leave greenery and my collection of nativity scenes. I have nativity scenes in every room and of various sizes. These stay up until the Epiphany. I really like the focus to be where it should be all along, the birth of our Lord. I am so glad to have your posts in my inbox…fun to follow!! Yes, I’m ready to get it down! Ive had mine decorated since nov. 15 for a Christmas party I had on the 20th! I’m rather in love with little lights on a small Christmas tree in an Italian pot behind my couch. I think I’ll leave that for a while. Looking forward to receiving your book…what a deal, and its autographed!!! Always good ideas. Your posts inspire me to look at my home in new ways. Thanx for the inspiration! I, too, leave the winter greenery & sparkle decor out at least thru Jan. Tree & Santas go away right after Christmas. Sending wishes for a blessed new year!!! I’m right in the middle of packing up all the Christmas decorations. Your article came at the perfect time. Thank you for the great ideas. Great idea! Thanks! I think I’ll leave the tree up which I always so anyway, but without ornaments, just my white lights and topper. Once again you have motivated me to make a few simple changes around the house. Happy New Year! Since Christmas is my favorite time of the year, we decorate the first week in November and do not take Christmas down until after New Year’s. We enjoy have lots of friends over and they always enjoy coming to our place over the holidays! Our last gathering will be New Year’s day. Then, we will pack everything away for another year. Love the little chalkware girl and the greenery in the trophies. I’m looking for trophies! We had a house fire two days after Christmas last year, so we lost a great deal of decorations. This year has been far more simple in decorations, so we may just put away Santas, etc., and leave the rest out for awhile. Great post! I’m so sorry Sunni. That is so scary! I keep red, white to go on to Valentines, just skip New Years. I love the idea of transitioning. I’ll take my tree down today and the wreaths came down yesterday. Now I have to decide how much of the mantle and tabletop decor can stay! I love keeping silver, white and snowy looking things out for winter. As I tire of them, they gradually disappear. Our old family tradition was to put Christmas away on New Years Day. Anita-I knew you’d have some great ideas for the next decorating season! Thanks! Since I decorate downstairs with blue and metallics, I leave most out after taking down all trees the first week of January. I keep our red and metallic themes going upstairs (minus obvious Christmas decor) and as Valentines Day approaches, add in some glass, mercury glass and blingy hearts upstairs and downstairs. This strategy has worked for many, many years. We’re in FL so after Valentines Day, we begin to think SPRING!! Hi Anita , I am a relatively new follower and never fail to read your wonderful posts. Your home is beautiful and just the way I love decor . Having been a life time collector of beautiful things when I see your style I think I collected the wrong things ! Is it ever too late to change my mind ?? I look forward to read what ever you share in the new year . Welcome Donna!!! I’m so glad you are here. Love all your ideas. I decorated with a lot of white and natural colors. I am leaving up greenery, lanterns with white candles, pine cones and snowflakes to ease into the winter. Thank you for the great transition ideas! I like the idea of the greens with the silver and gold. I undecorate the second day after Christmas! I rest on the first day after ? It feels so nice to have the space back again an less clutter. 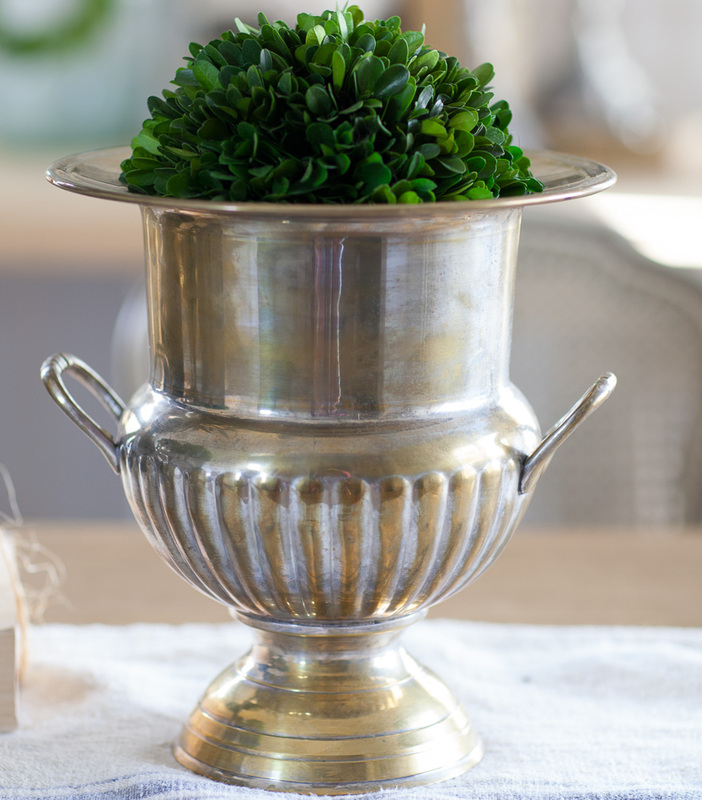 I love your greenery accents in silver containers! It’s fun to have a few winter decorations lingering after Christmas! I leave Christmas decor up until Jan. 6th ( Twelve days of Christmas)….and then yes, all my greenery takes center stage. I love the little lemon cypress..that I purchase every year. I keep them in the house through spring, then plant them outside. I have kept them in front of a sunny window throughout the year…but they seem happier outside. Happy New Year to you and yours! I love leaving my mercury glass out through January — it seems to hint of the winter scene outside (although here in Georgia we almost never have snow). Thank you, as always, for all your ideas and inspiration! I have to leave mine up because my son and his family come for New Years to celebrate Christmas. But the Monday after everything starts coming down. Then I love the purging and organizing that goes on during January. I love to mix the greens with rustic then pop in some mercury for bling. Do you ever put your house on a real tour?. Would love to see in person. I love Christmas and the reason for the seat,but when the day is done I’m ready for the deck to be put away. I have been known to take the tree down Christmas night.? 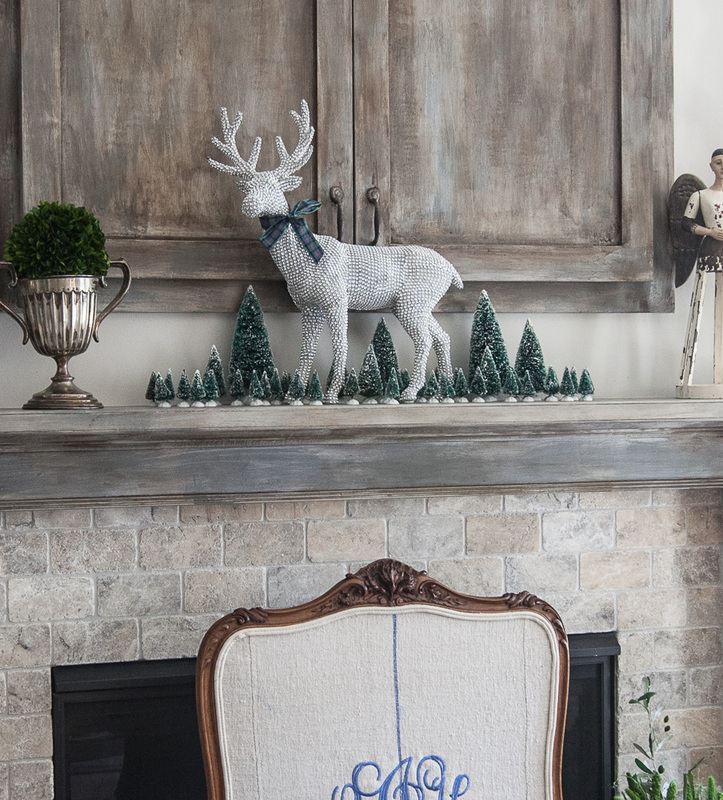 Love the mantel with the little trees and the reindeer. Super pretty! Visiting from Inspire Me Monday party. 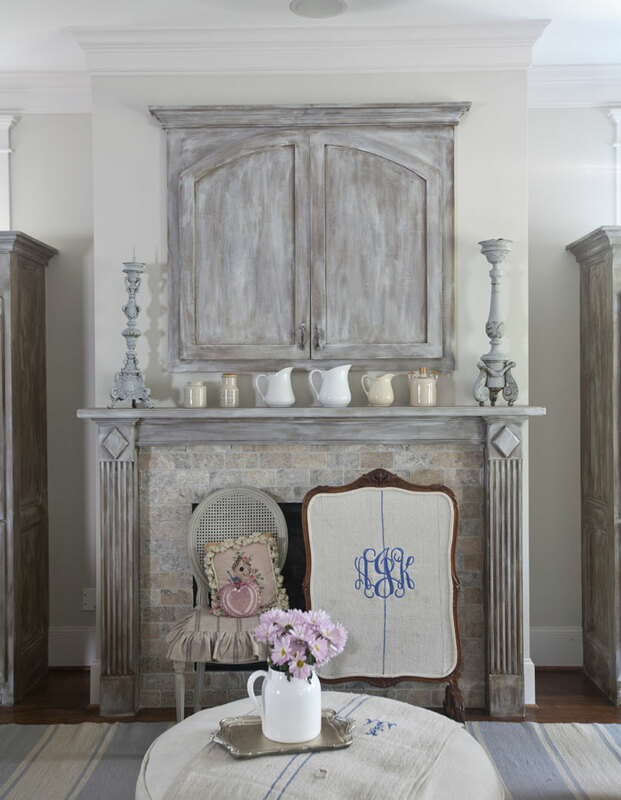 Lovvve your fireplace and mantel. So classy but has a rustic vibe. I never take any Christmas decorations down until after January 6th. And then , I would love to hire an elf to help me ! and then I will focus on Winter decor . I love the idea of removing the reds. Keeping the greenery looks so great it sure keeps the room feeling fresh and alive. Great job!! I take down and store away anything that is Christmas specific such as my Christmas trees and Santa’s and Nativity scene. But over the years I have moved away from holiday specific decor to four seasons decor so yes a few things will be put away on New Year’s day but plenty of thing will remain until the first of March. 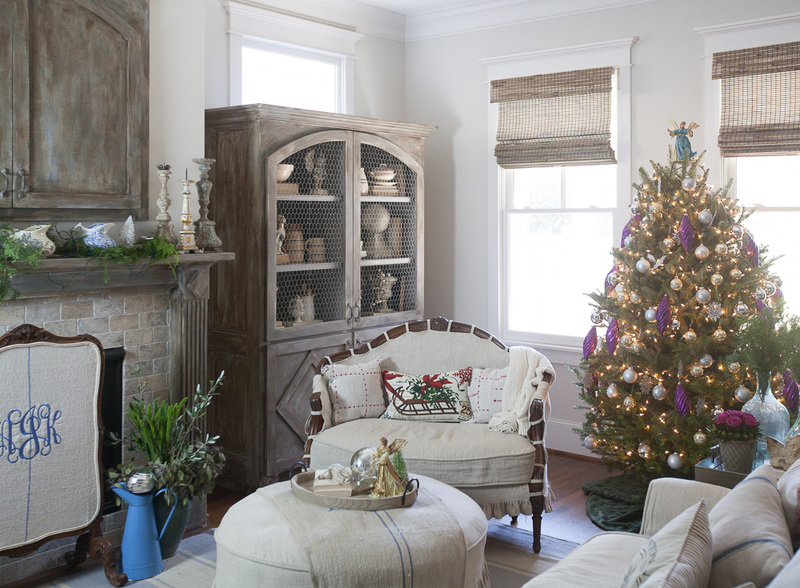 Love my Box wood greenery, pinecones tipped with snow, snowflakes, pale blue, silver and ivory colors, and, and warm throws draped over favorite couches and reading chair. For the other three seasons, I have eliminated Easter, Fourth of July, Halloween, Thanksgiving, etc. and instead just gone with general spring, summer, and fall decor. Anita, I like to leave things in place till New Year’s Day. Then I use the next days to organize and put things away so that it is easy to decorate the following year. This year we plan a small remodel which will take my current closet that is used for Christmas storage. I’ve had to rethink how and where I will store my Christmas, so I suspect I’ll be taking more time to put things away. 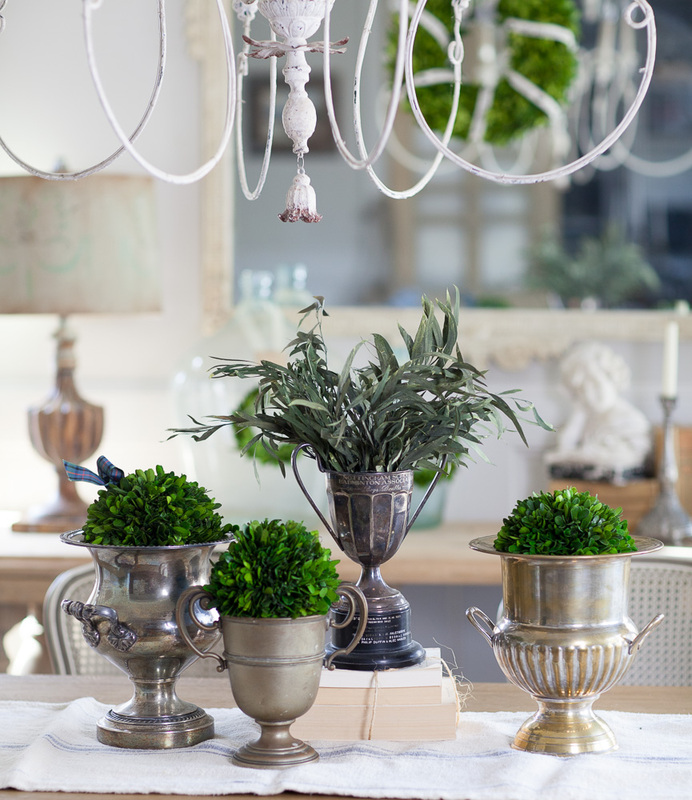 I pinned your table top with the group of vintage champagne buckets and trophy cups filled with boxwood orbs. Love this look! Happy New Year, Anita. Hope to see you at Round Top in the spring. Sarah, I just purged a ton of stuff, and I have several closets that are now so much neater with a lot less stuff in them. It’s amazing how much we accumulate that we really aren’t going to ever use again. I hope to see you at Round Top also! We won’t have a booth, but I’ll be shopping!!! Great ideas! Love your blog, and I love your taste in decor. An early Happy New Years to you! Oh and I’m sorry about Sunni’s house, I can feel for her, bless her heart. Happy almost New Year’s, Anita! I have our tree up still but will be taking it down tomorrow. It’s time. For the new year, I like decorating with whites and this year I might move to pink and white with touches of silver in my candlesticks. Hey Barbara, that sounds very nice for the new year. 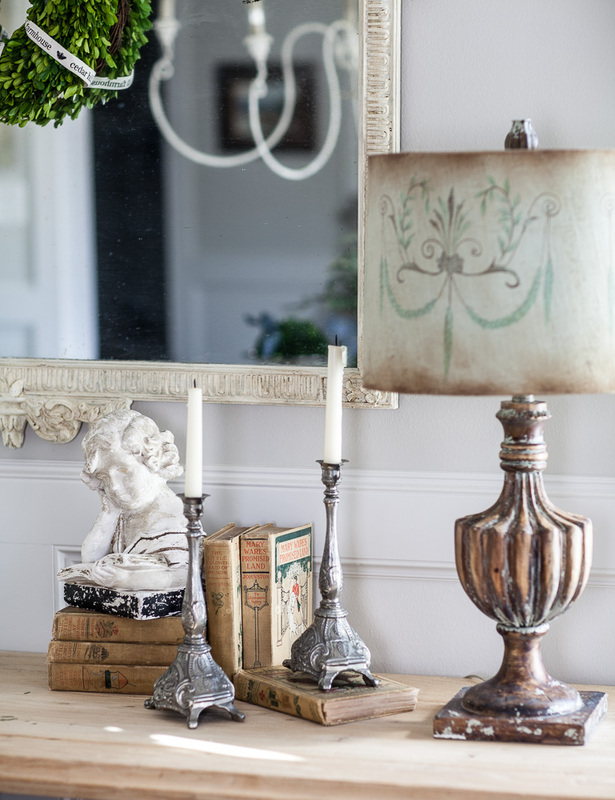 After all of the Christmas décor, I am always ready for something that looks clean, so white is perfect in my book. A little pink thrown in sounds perfect also.